*Don’t forget to scroll right to the bottom to checkout the transformation! My first visit to this particular shop space when I was around 15-16 years old (maybe 2001-02). At the time I was obsessed with leatherwork, I had borrowed all the books from the library and was on the hunt for supplies and more know-how. Being a Frankston local all my life I knew of one shop – Don’s Custom Leatherworks. A hole-in-the-wall type establishment with one narrow staircase leading up to the unknown. My curiosity was peaking, what or who would lie within? On entering Don’s shop I recall being in awe of all the sights and smells. All the tools and materials of Don’s trade on hand. Experiencing a craftsperson’s workshop, with works in progress to explore and finished objects to marvel at. Though the memories of my few visits have faded, I do remember Don’s willingness to help me get started. Setting me up with the leather and tools I would need, him offering advice on how I might go about my projects. I have a feeling he thought I was just some crazy kid (this was during my hippie phase after all!) but Don helped me complete several projects so I’ll be forever grateful. Don and his shop left me with one lasting realisation – that it was possible to be both craftsperson and business owner. And though I held this realisation closely and likely never told anyone until recently, I envisioned a life where I was creator, craftsperson and teacher. Back to present day, I was contemplating that next step for Loom & Spindle and came across the real estate listing for Don’s old shop. That unmistakable feeling of serendipity hit hard. I dismissed it (I’m a logician after all). I had a million reasons why this could be a mistake… or even fatal for my business. It kept playing on my mind, I couldn’t shake it. Just one inspection wouldn’t hurt, hoping that would appease my logician brain. But we know how this storey ends, I signed the lease! I’ll let the images below tell the storey of the shape the shop was in on my first inspection. There were bars on all the windows, nails sticking out of the floor, and the agent showing me around almost had an asthma attack due to the amount of dust in the air. But it had great bones as they say – timber floors, high ceilings, copious amounts of natural light. The perfect character-filled hideaway for the intense focus and creativity required to run a business. Without a doubt the opportunity to create my vision was here. Thanks Don, for letting me make your home my home! PS: Don sold me a leather punch which I still use at the office almost every day! Kismet! The latest edition to the Woolsey weaving range is Woolsey XL, a super bulky roving yarn destined for bold texture and big finishes! Perfect for soumaks, knotting and inlays, you can incorporate Woolsey XL into any tapestry inspired project to create super-sized texture and lots of woolly warmth. The light twist added during milling provides a subtle structure that improves the overall workability of the yarn, when compared to working with unspun roving or top. Something that will definitely come in handy when working your favorite weaving stitches. Given the lightness of twist this yarn is prone to pilling. It is best suited to tapestry projects that won’t see a lot of wear-and-tear such as wall décor and decorative home furnishings. CARE: Cool hand soak, lay flat to dry. Woolsey XL is intended for tapestry style weaving projects where bold textural elements or woven inlays are desired. The yarn can be worked by hand using long or short lengths. Steam blocking may be used to reinvigorate and set the fibres. To steam block, set your iron to a temperature appropriate to the fibre content of your piece. Lay your piece flat on a heat proof surface, place a damp towel over the area that requires blocking. Gently move the iron across the surface allowing the steam generated by the damp towel to penetrate the fibres beneath. This yarn is intended to be woven in a more free-form style utilizing soumak, knotting and inlay techniques. It’s generally unrestricted by gauge, but for best results we recommend a wide sett of 4-5 epi (16-20ends/10cm). Angora Nep by AVRIL combines a luxurious blend of wool and angora with flecks of nylon nep to produce a charming tweedy lace-weight yarn suitable for tapestry weaving, weaving for yardage, and other popular fibre crafts. Being a rather delicate yarn, a spinning oil is applied during milling. As a result, the true texture and appearance of the yarn remains hidden until a final wash fluffs and softens the fibres. With the yarns unique construction and a palette of 13 light and dark hues, Angora Nep is perfect for building your own yarns and blending colours to create one of kind textures and palettes. Simply combine multiple stands to produce unique fabrics and stunning colour work – think elegant gradients and soft transitions! Angora Nep is suitable for most fibre crafts, including tapestry weaving, weaving for yardage, knitting, crochet and felting. You’ll find a list of suggested gauges for various projects below. If you intend to felt your piece or apply a more vigorous finishing technique we suggest working the piece 10% to 20% larger than the intended size. 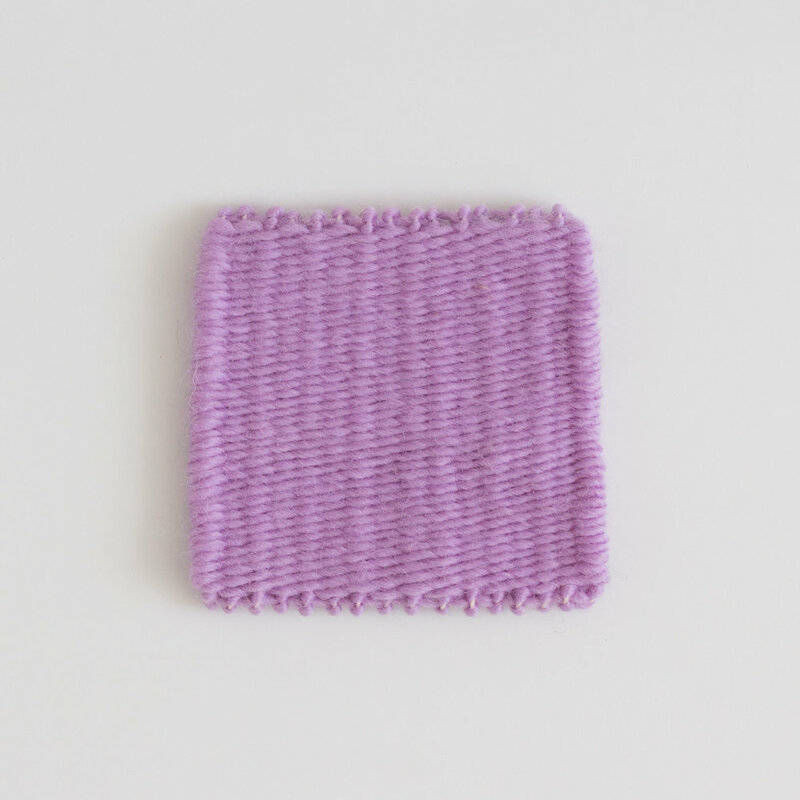 It’s highly recommended that a test swatch be made, applying your intended finishing technique to assess the variables of the fabric you’ve crafted. To remove the spinning oil applied during milling, prepare a bath of tepid water and if desired add a few drops of mild detergent or wool wash. Immerse the finished piece and allow to soak for 10 to 15 minutes. Lift the piece from the water and allow to drain. Gently remove excess water by pressing the fabric between layers of a dry towel. Lay flat to dry. The texture and appearance of your fabric can be manipulated by using warm/hot water and agitation. Be sure to test the effects of these variables on a sample you’ve swatched before applying them to your finished piece. 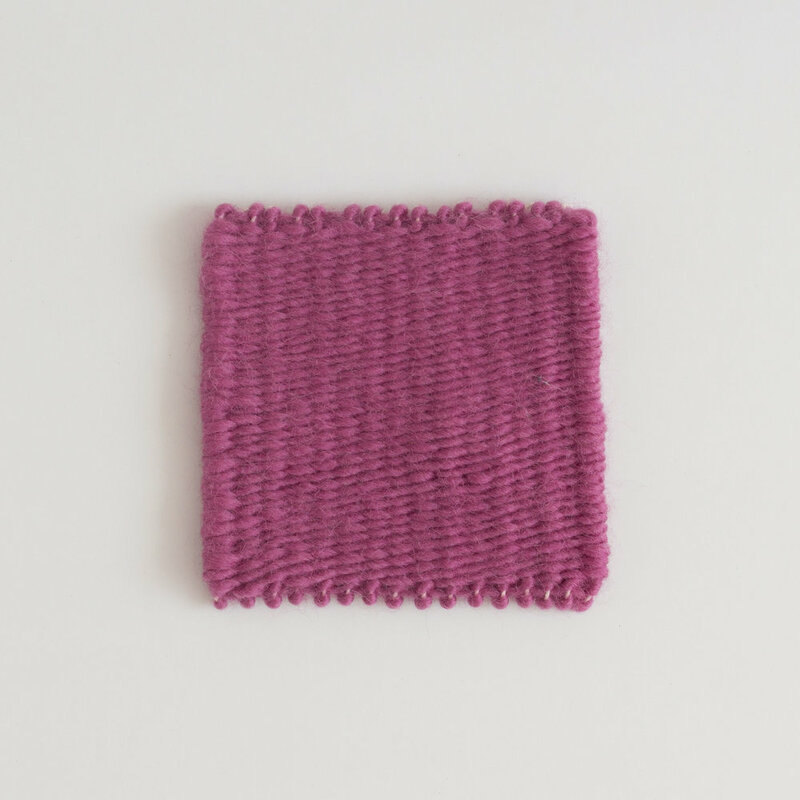 Determine gauge by working a test swatch in your preferred craft and apply your preferred felting technique. The first weaving yarn by Loom & Spindle! A weaving yarn that has a structure and composition that was carefully considered and selected specifically for tapestry weaving. Woolsey is a single ply 100% wool yarn with moderate twist. These elements come together to produce a smooth inelastic yarn ideal for tapestry style weaving where a dense and cohesive fabric is desired. Where multi-ply yarns can shadow and dull the surface of the tapestry fabric, Woolsey’s defining single ply construction helps reduce these effects, encouraging a smooth bright fabric surface. 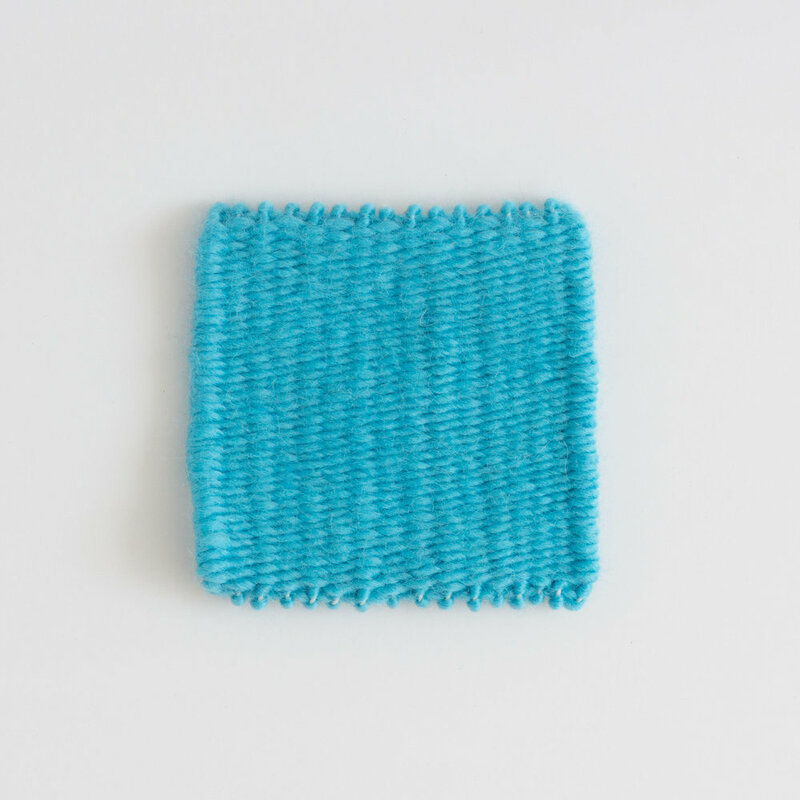 When woven at gauge, Woolsey produces a clear and well-defined weave ideal for working shapes and textural stitches. With our recommended warp sett of 4-6 epi (16-24ends/10cm), Woolsey will always get predictable coverage taking the guesswork out of project design. With its quick and easy coverage, Woolsey is ideal for tapestry inspired weaving projects destined for wall décor and home furnishings. The name ‘Woolsey’ was derived from the traditionally woven fabric, linsey-woolsey. Linsey-woolsey is a coarse and hardwearing fabric woven from a cotton or linen warp and wool weft. Though this fabric was woven for yardage, the parallel between the foundation elements of this fabric and tapestry was not lost on me and consequently inspired the name for our new range. Woolsey is available now in a palette of neutrals, bright primaries and soft heathery hues. Check out all 21 shades and find the right combo for your next project. Our first tapestry workshop in Woolsey is a study in colour transitions, it’s a simple technique for working soft transitions between two solid colours. Grab a pair of your favourite Woolsey colours and start weaving! WANT EXCLUSIVE ACCESS TO OUR EVER GROWING LIBRARY OF RESOURCES? To unlock our free downloads join the Loom & Spindle Collective today! With the gift-giving season now upon us, it can be a daunting challenge to find that special gift for the passionate maker in your life. To inspire your search I’ve put together a handy list of some of our favorite gift ideas. Whether they’re young or old, a beginner or an experienced crafter, I think we’ve got your loved one covered with our Six Gift Ideas To Inspire Holiday Crafting! This one’s for your adventurous crafter keen to experiment with textiles and fibre. The kit provides all the necessary inclusions for spinning their first yarns. It makes for a great new way to get creative with yarn and fibre and extend your loved one’s passion for making. A frame-loom weaving kit is brilliant for those with a special interest in exploring tapestry or free-form weaving styles. 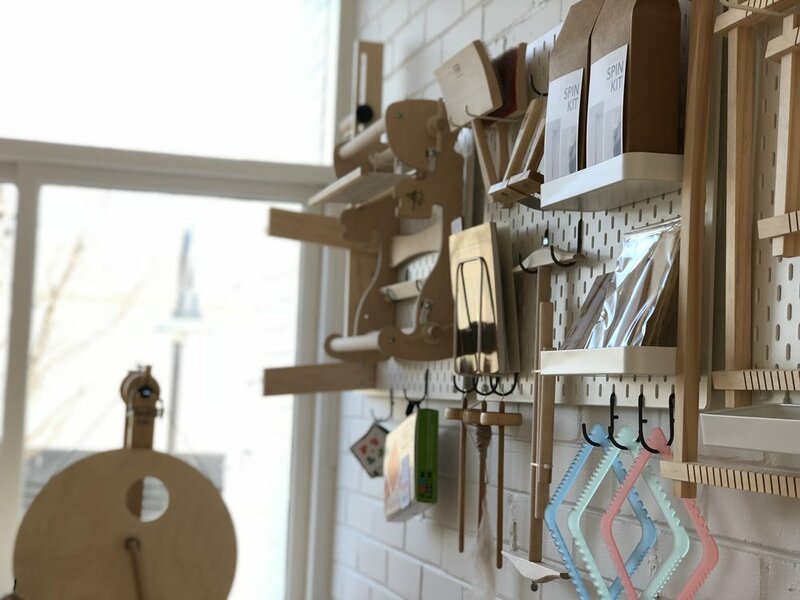 Frame looms lend themselves to a range of projects and the inclusion of our tool kit will give them the opportunity to try various weaving styles. Loom & Spindle also offer a range of free resources to get your new weaver started. Support your experienced weaver to take the next step in their work with these beautifully handcrafted tapestry bobbins. Made from beech wood these bobbins are hand turned and polished with a smooth clear finish. They’re perfect for those wishing to explore more traditional tapestry techniques. This one’s perfect for the little crafter in your life. It makes an ideal learning tool for hands-on discovery. It's small size makes for quick and easy projects that can be completed in no time at all. Craft in colour with our new range of vibrant cotton warp threads. This would be a welcome addition to any weaver’s stash. With a palette of neutrals, bright primaries and softer hues to choose from, there’s sure to be a shade that’s right for your maker. Encourage your maker to take time out for journaling and creativity with a notebook set. They can record their daily inspiration and ideas for new projects. Offering them a personal space for reflection for more intentional crafting.